On Thursday, 14 January, the innovative ultrathin staircase was installed in the lobby of ABT Velp. The staircase was designed by JHK Architects and executed in the form of a Jacob’s ladder with glass handrails. 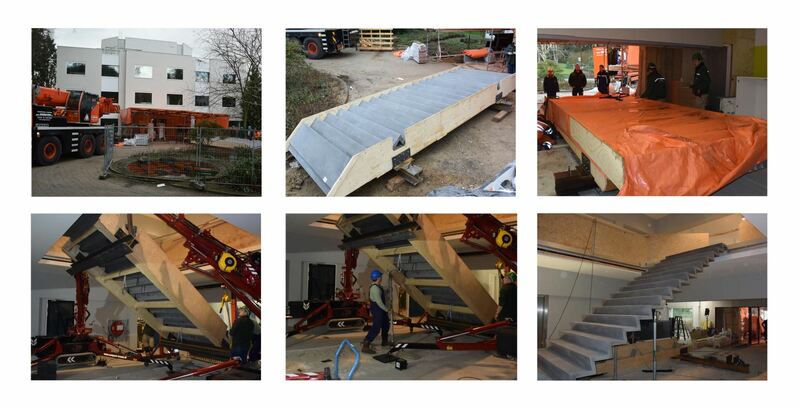 Contractor Romein Beton delivered the ultrathin staircase in the early hours of Wednesday, 13 January (1). The staircase was subsequently rolled inside on wheels and stripped of its covering (2/3). With the help of a crane, the ultrathin staircase was installed in the lobby (4). Initially the installation of the staircase did not go smoothly. The construction of the staircase was so heavy that the crane could not lift the weight. It was decided to build a support structure on site (5). The staircase was finally hoisted up at 6 p.m. At approximately 8 p.m. the ultrathin staircase was installed in the correct position and there was a positive angle (6). Are you interested in the further developments of the staircase? Follow the blogs of Michaël Menting or read the innovation page on our website.